On the 8th of November, West 8 presented two design options for a new slow traffic bridge over the Wilhelminakanaal in Oirschot. Held in Oirschot’s municipality hall, the presentation was attended by over 300 people. On 3rd of November 2016, the vision for Kijkduin-Bad’s public space, designed by West 8 and commissioned by the municipality of The Hague, was presented to the residents and business sector of Kijkduin-Bad (which literally translates as: Outlook-Dune’s Swimming-Beach), located along The Hague’s seashore. The first outline of the plans, which were initiated in 2008, are now taking shape. Kijkduin-Bad is a popular family destination. In the vision prepared by West 8, it will be enriched with new dunes, beach grass, a ‘Balcony at Sea’, a lively promenade and easier and safer traffic flows. Central to the vision for Kijkduin’s public space is the return of the Dutch dune landscape. This creates an awareness of the proximity to the sea and reinforces the traditional Dutch coastal experience. West 8 Design Director, Adriaan Geuze: ‘Upon arrival you immediately sense the beach and the scent of the sea.’ His presentation was applauded by the audience. West 8’s vision provides a careful spatial integration of several multifunctional real estate developments. 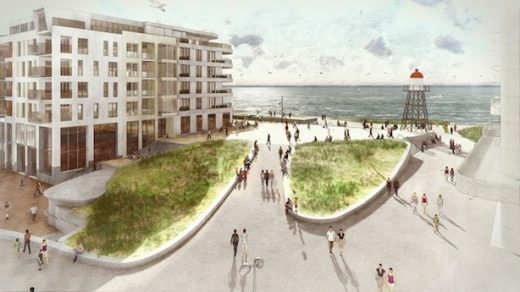 Located along the seaside boulevard the existing Atlantic hotel will be renovated and enlarged and the retail centre completely renewed and extended. In addition, a total of around 650 new dwellings are planned for the entire village. To reinforce the identity of Kijkduin as a small coastal settlement West 8 has emphasized aspects like intimacy, seclusion and shelter. Beachgoers can enjoy themselves along a 250 meter long promenade complete with restaurants and terraces. The main entrance route, the Kijkduinsestraat, is designed as a gateway to the sea. The existing Deltastraat is part of the coastal green belt and will be adorned with sand and beach grass. Several passageways connect the inside of the new shopping area with the Delta Square and the Boulevard. The entrances to the upstairs apartments are also located within this shopping area. 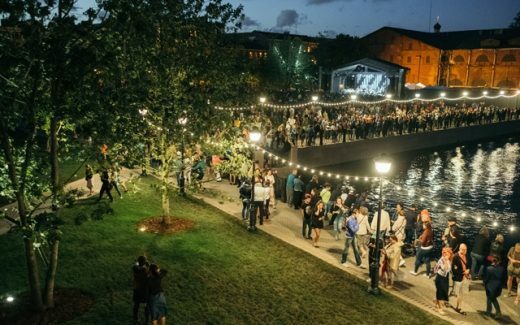 In accordance with a new master plan developed by West 8, and approved by the Investment Committee and the Council for the Preservation of Cultural Heritage of the City of Saint Petersburg, New Holland Island’s first phase of restoration and regeneration has been completed. Elected officials of the Bordeaux City Council have voted in support of the proposed revitalization of Place Gambetta in Bordeaux, which is to be developed in accordance with West 8 + Sabine Haristoy + Cetab’s winning competition proposal for the historic square. This September the schematic design for More Moss Park in Toronto was presented to the public. MJMA, West 8 and Public Studio working closely with The City of Toronto, ‘The 519’ and the community have created a community-based proposal to enhance and expand existing programs, facilities and park space on the 3.4ha site. West 8’s project ‘The New Hondsbossche Dunes in Petten’ wins in the Planning category of the 8th edition of the Arie Keppler Award. The awards ceremony, held in Velsen town hall in North Holland, was part of the festive closing of the jubilee event ‘OVERMOOI’. West 8’s Co-founder Adriaan Geuze, New York Principal Claire Agre, Longwood’s Executive Director Paul B. Redman and Director of Horticulture Sharon Loving discuss the design behind the ground-breaking landscape at Longwood’s Main Fountain Garden. The 5-acre revitalization project in the heart of the Gardens is scheduled for completion next summer. The Hills on Governors Island opened to the public July 19, adding 10 new acres of public space for the City of New York. New Yorkers and visitors are already eagerly exploring the Hills and their new landscapes, public art, play areas, slides, and extraordinary 360 degree views of the New York Harbor, Lower Manhattan, Brooklyn and New Jersey skylines, and the Statue of Liberty. Designed by West 8 urban design & landscape architecture, the Hills are the culmination of the award-winning Governors Island Park and Public Space Master Plan, and Phase 1 of the Park and Public Space project. Rising 25 to 70 feet (8-21 meters) above the Island the Hills offer an extraordinary 360-degree panoramic experience of the NY Harbor. 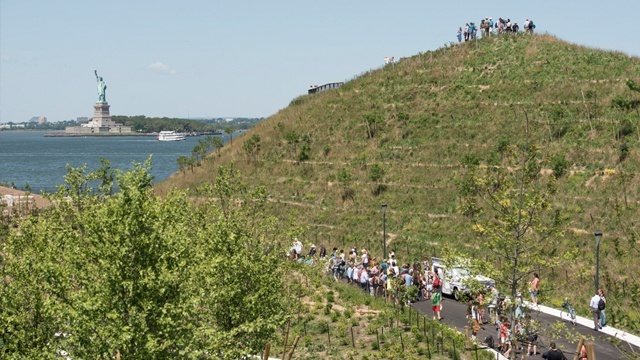 The opening of the Hills marks a major milestone in the transformation of Governors Island from an abandoned military base into an iconic destination for New Yorkers and visitors alike. The Hills are constructed of recycled demolition debris, general fill and lightweight pumice, stabilized with geotechnical reinforcement and covered with shrubs, trees and grassy lawns. While the Hills provide striking vistas and comfortable settings for relaxation and play, they also improve the island’s resilience in the face of increasingly dramatic weather patterns and rising sea levels. In accordance with a new master plan developed by West 8, and approved by the Investment Committee and the Council for the Preservation of Cultural Heritage of the city of Saint Petersburg, New Holland Island’s first phase of restoration and regeneration is approaching completion. – The placement of temporary pavilions for hosting cultural events as well as facilities necessary for the administration of the park (kiosks, info-centers, a stage, restrooms, and entrance). 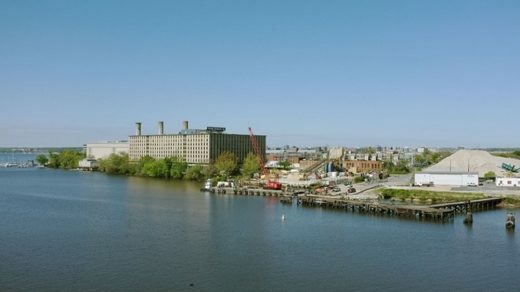 Work will continue on the renovation of the large historic complex of former warehouses, which are scheduled to be fully restored and ready for use by 2025. Nevertheless, the island will now remain open year-round, including during the winter season. After the recent success of the public arts and culture program Summer on New Holland, lead by Dasha Zhukova’s IRIS Foundation, New Holland Development decided not to proceed with the original plan to construct a new building on the island. 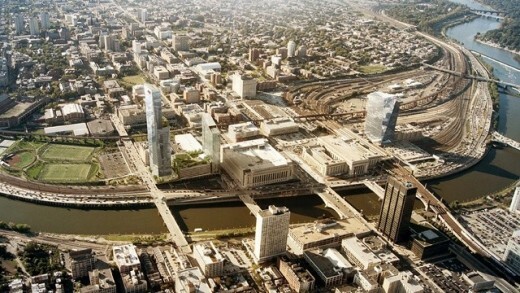 Instead, they chose to organize a full-fledged city park, complete with infrastructure with a focus on adaptive reuse. To implement this idea, they employed West 8, under the direction of Edzo Bindels. Observation and research conducted during the temporary programs helped inform the new master plan for development of the island. The proposal was first presented to municipal authorities in 2014 and received official approval. All of the projects listed above have been realized over a span of only two years. The second phase of restoration and renovation is slated to be completed in 2019. This phase includes the restoration and landscaping of the area around the buildings of Corpus 12, which comprises a total area of more than 15,000 m² along the Kryukov Canal, on the side of Ploshchad Truda (Labor Square). Developed and refined with extensive input from the public, West 8’s master plan reflects the top desires of the community: walking trails, experience of the bayou, shady pathways, access to nature, and places to host community events. The 120 acres on which the Houston Botanic Garden will grow is bordered and bifurcated by Sims Bayou. The site is a fertile location that has provided the design team with a unique opportunity to integrate Houston’s waterways and complement the natural landscape. 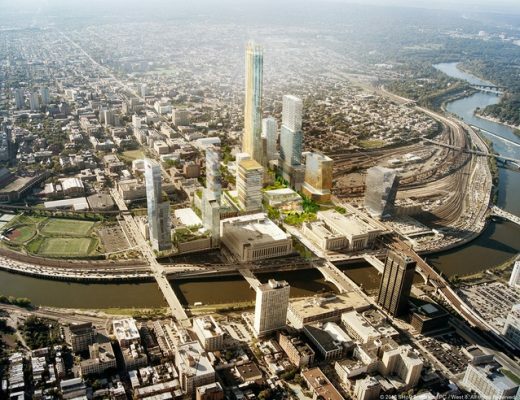 West 8’s design gives forethought to the site’s biggest environmental challenges: flooding and intense weather events. Using Sims Bayou and the Bayou Meander as site-organizers, the Master Plan design shapes and sculpts the existing topography to create gardens along the bayou edge that absorb and invite flooding. The design also elevates the heart of the garden above the 100-year flood plain to protect buildings and the Collection Gardens from Houston’s intense floods. The Garden is divided into two main precincts: the Island and the South Gardens. A scenic driveway called the Botanic Mile leads from the Garden entrance off Park Place Boulevard, leaps over Sims Bayou with an iconic bridge, and brings visitors to the arrival plaza in the South Gardens. The Island will be dominated by gardens, both naturalistic and cultivated. These gardens provide year-round beauty, delight the senses, and offer educational value. A botanically inspired glass conservatory extends the plant repertoire by providing a setting for exotic plants from tropical climates. Visitor-oriented amenities – like educational facilities, an events pavilion for weddings and community receptions, a café, and a lecture hall – are strategically located to provide destinations and provisions for guests. All of these are linked by an extensive network of pathways, many of which offer shade and are weather-protected by colonnades. 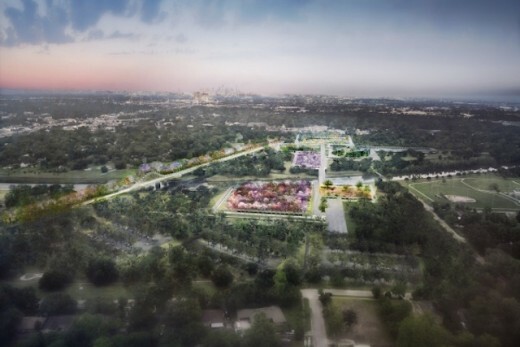 By weaving together shady pathways, a mosaic of ever-changing gardens, the bayou and other water bodies, West 8’s Master Plan for Houston Botanic Garden amplifies the potential of the site’s qualities and unites the site into a coherent, “only-in-Houston,” garden experience. Construction of the first phase of the 120-acre project, located off Interstate 45 between William P. Hobby Airport and the University of Houston, is slated to begin in 2018. Work is well under way on Jubilee Gardens and important milestones have already been achieved as the Gardens continue to take shape, including the installation of new drainage, the formation of tree pits and the production of granite seating edge units and paving setts. A joint venture of West 8, Trama Arquitectos and Estudio 3.14 design an urban renewal project for Vallarta’s iconic waterfront, locally known as the Malecón. This project has been carried out through the summer of 2011. This will mark a Renaissance for Vallarta’s historic district in a matter of just 5 months. The initiator of this waterfront project is the mayor Salvador Gonzatez Reséndiz. He committed to an urban transformation with a rather inventive approach. The Town of Vallarta now holds an progressive and large-scale visionary strategic plan for the next twenty years, with a series of tourist destinations including the Malecón as the soul of the Historic District. The West 8 design aims to project the Puerto Vallarta atmosphere, Mexico’s only beach destination set in a traditional village, into a new paradigm without losing its identity. It is conceived for the locals and tourists to mingle harmoniously with the romantic sunsets over the Pacific Ocean. The public space scheme of the Malecon, uses a series of strategies to reintroduce the public realm to a human scale. The design provides comfortable shade in pedestrian areas accommodating inspiring view-lines to the ocean for visitors and residents. Innovative lighting has also been introduced to enhance the romantic moonlit effect. The main feature of this unique place is the Mosaic paving, using the traditional local pebble-stone pavement technique. A native myth of creation, as narrated through drawings by the Jalisco born artist Fidencio Benitez, gave birth to the composition of the new mosaics pattern. The pattern is crafted under supervision of a professional prominent craftsman Amador Gomez Piña. The scale and challenge of the mosaics paving enhances the identity of local ethnicity and handcraftsmanship, two of the major attractions of Mexico, positioning Puerto Vallarta for a new era. These custom designs transform Malecón into a contemporary, vibrant and pedestrian-friendly public space. West 8’s winning competition entry features a grassland with stylized concrete tracks which make a patterned landscape in which the buildings float. The design is characterized by its modesty, and by the strategic integration of the monumental buildings with their broader context. The City of Madrid has won the “Golden Swing” award as initiator of the ten children’s play areas located in the Salon de Pinos in Madrid. The playgrounds are designed by West 8 urban design & landscape architecture and MRIO Arquitectos and are part of the master plan for the reclaimed riverbanks and the new urban area on top of the M30 freeway tunnels. The competition was convened by ExpoAlcaldía 2010 and the awards were presented in Zaragoza this week. West 8 project “Neues Wohnen in Hamburg-Jenfeld”, designed for the City of Hamburg Bezirk Wandsbek, Bundesanstalt für Immobilienaufgaben and BSU, has been awarded the Gold Award in this year’s International Urban Landscape Award (IULA). The ecological neighbourhood project is the winner of the €25,000 prize.